This is old version Crusaders Quest 2.6.7.KG apk for Android, you can install it if you want to downgrade or install old app. It is top Role Playing apps from NHN Entertainment Corp.. Moreover, the story mode will take a long time to finish, so you will spend a while with this real-time fast-paced game. The mechanism of this game is easy to follow, but you will train your reflex, mind, and timing as you solve many puzzle combats and defeat the foes. This unique gameplay will bring your RPG sense to the next level. One of the biggest features Crusader Quest has for you is the massive customization of your party. Choose the characters from 6 different classes, and customize them to your liking. You can also get over 200 heroes for your team, which enables you to fully customize your party roster. Finally, there’s also the Colosseum mode, which tackles you against an endless swarm of foes. By assembling the perfect team, you will tear down the opponents and claim the rewards at the top of the battles. 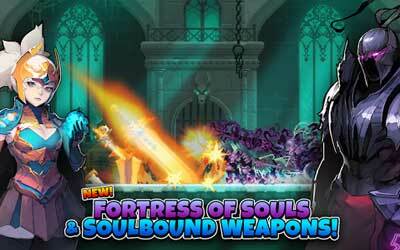 You will bring the fun part of RPG to the next level by playing Crusaders Quest for Android. Gear up 6 Unique Classes, with over 200 Unique Heroes in this 16-bit world! Choose the Powerful Warrior, the Magical Wizard, the Precise Hunter, the Lightning Quick Archer, the Priest with the Healing Grace, or the Paladin, who strikes with Holy Might!